Look at this face! This is 2 1/2 year old tiger Daisy, the day we met her. You’d never know from this picture, but Daisy has a neurological disorder. She is ataxic, has an uneven gait, trouble with her balance, stumbles, and has stunted growth. Daisy takes a little bit longer to do normal tiger activities. She doesn’t know any different – but we do. Even with her positive attitude, that doesn’t mean life will be easy for her. 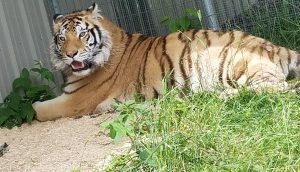 Now that she’s arrived here at The Wildcat Sanctuary, we’re going to do everything we possibly can to make sure she has the best quality of life. Within a short time, she’s already made a huge impression on our hearts. And there’s no doubt, she’ll do the same to you! As we sat in a staff meeting, we received a call from the USDA (U.S. Dept. of Agriculture) and a separate call from an out-of-state owner. 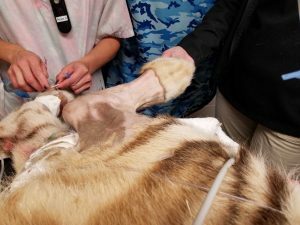 They needed our help to provide medical attention to two tigers. One could possibly be critical. The other had been having some mobility issues for quite some time. They called knowing we had the resources and partnerships with specialists to give these tigers the medical care and life they deserved. In pouring rain, we loaded transfer crates, safety equipment and supplies into our rescue trailer. Other staff drove to the cities to rent an F350 truck to tow the trailer. There was no time to grab a change of clothes, or even book a hotel. 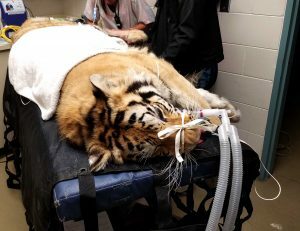 We’d drive straight through, there and back, while scheduling specialty appointments for these tigers to be seen at the University of Minnesota Veterinary Medical Center. We jumped into action, drove over 700 miles one way, arriving to help Daisy 15 hours later. Upon return, Daisy immediately had an expensive, but necessary CT scan and full exam. 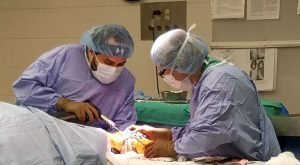 It was extremely important to rule out a brain tumor, inner ear issue, or skeletal deformity that could be compressing her spinal cord. All were negative and left us with more questions. Now, we had to look into issues we couldn’t see. A nutritional deficiency, fungal exposure or parasite? In the meantime, we could develop a plan for supportive care. Bloodwork showed her kidneys were elevated from the current medication she was on. We’ll taper her off that medication and put her on something better for her long-term health. We, along with the University’s team, were also attending to the second tiger. Mohan, a white tiger, is just as special as Daisy and his story is just as important. 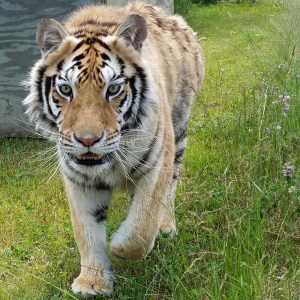 Be sure to tune in tomorrow when I’ll share more about this majestic tiger, too. 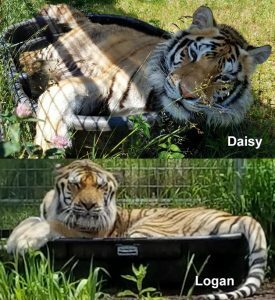 Both tigers are now in quarantine at the sanctuary as we develop the best possible medical plan for their future. We’re happy we can provide lifetime care and medical treatment for Daisy and Mohan – thanks to you! We’ve offered the same for the remaining animals there, too. We’ll be there at a moment’s notice, free of charge, to help. All of this emergency care is only possible because of you! Thank you for helping us save lives and care for so many, at a moment’s notice when it’s most needed. Will you help Daisy by donating to her medical care? Every donation, no matter the size, will help treat and provide care for Daisy and Mohan. I’m so proud of the team we have here at TWS! Everyone pitched in, whether on the road or back at the sanctuary caring for the cats. It takes so many working side-by-side to pull off these last minute, urgent rescues. And most of all, I’m thankful to you for being there when we need you most, too. There’s no question, when a cat’s urgently in need, I know you’d want us to do everything possible to save them. It comes at a high price, but when we all work together, we can do this! As you know, Daisy is a cheerful tigress with a complicated medical history. Ours and your commitment to her has never wavered, and neither has the joy she brings all of us each day. Daisy has had a set back and is having mobility issues with her left foot and leg. This is the same leg that remained uncoordinated after her treatment began for meningitis. We’re unsure if this is an old injury that she aggravated or something associated with a bone density issue. She’ll be seeing more specialists next week to help determine the cause and hopefully repair this problem. Thank you for keeping her in your thoughts. She’s such a special tiger we love very much. Yesterday was another long day at the University of Minnesota Veterinary Medical Center for Daisy. This young girl has been through so much already. When we noticed she wasn’t bearing weight on her rear foot, we immediately made arrangements for her to be seen by an orthopedic specialist. Radiographs and surgery revealed an old heel fracture that had calcified, surrounded by thick scar tissue. Thankfully, the surgeon was able to pin and plate this fracture to stabilize her foot. These will remain there permanently. We’re to keep her quiet for the next 8 weeks so she can heal properly. If you’ve seen how playful and rambunctious she can be when she’s feeling well, you know we have our work cut out for us! She’ll be in her inside bedroom area and eventually have access to a small outdoor space so she can recuperate. We probably won’t be able to share photos much since we want her to remain as calm as possible so time can heal this fracture. We know you’re as anxious as we are to see her pain-free and carefree like the Daisy we’ve come to love so much. Thank you for your continued support, both emotional and financial, for this very special tiger.